St Michael’s at Bowes, CE Juniors, Enfield has recently achieved the Inclusive School Award. St Michael at Bowes C.E. Junior School strongly reflects the requisite standards of the IQM Inclusive School Award. The needs of each pupil form the basis for school policy and effective inclusion is at the heart of all decisions. The school is a three-form entry Voluntary Aided Church of England Junior School, receiving most of its intake from a local authority infant school. It is situated very close to the London Borough of Haringey and receives pupils living there as well as the immediate area. It has an ethnically diverse pupil group and on the day of the assessment it was reported that there are 48 first languages other than English being spoken. At every level the Headteacher and senior leaders have worked hard to ensure that clear systems are in place to guide and inform staff, pupils and parents of school expectations. The website is informative and easy to navigate whilst holding a huge amount of information. The strength of this systematic approach means that there is clarity of a vision which is explicitly shared with all stakeholders. This is supported by a comprehensive and well-presented School Improvement Plan, which is a living document assisting the school as it strives to meet its aims and aspirations. Staff form a dedicated united team where the contribution of everyone is valued and respected and where the needs of the workforce have received focused consideration. Special attention has been given to day to day workload and a review of planning and marking of work books has resulted in some innovative changes, enabling teachers and the support staff to focus more closely on the needs of the pupils. Teaching Assistants and a Learning Mentor have a high degree of autonomy and recently led a carousel activity for teachers to increase awareness of the interventions they use with pupils. Oracy and the development of linguistic skills will always be a key focus for staff as they embrace the challenges faced by so many pupils striving to achieve a mastery of English. A key member of staff has special responsibility to support pupils in the early understanding and use of English and she has developed successful strategies for moving pupils on swiftly. The school also takes a more holistic approach to the development of language and offers a wide range of activities to improve and challenge the pupils. 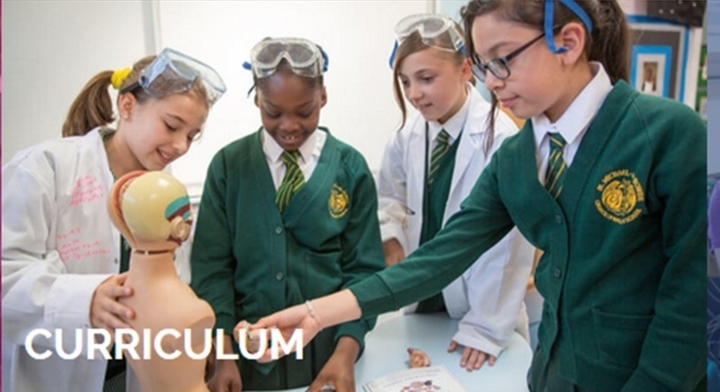 Extra-curricular activities include a debating society and newspaper club and the use of quality texts within the classroom to enrich learning experience. Singing is a powerful tool and pupils are given the opportunity to sing solos and duets as well as within larger groups. There has been a significant increase in academic progress with the 2017 KS2 cohort achieving well above the national average in every area and in Maths taking the lead by 16%. As a Church of England Voluntary Aided school its religious character is directed by the London Diocesan Board for Schools (LDBS) although the majority of pupils have other faith backgrounds. Senior leaders carry out a remarkable task in fulfilling their responsibility to hold the Christian ethos at the core, whilst also honouring, respecting and celebrating the faith and beliefs of all pupils in the school. The result is a feeling of great respect and understanding of difference, whilst at the same time acknowledging fundamental similarities in attitudes and principles within the various faiths represented. The home page of the website states “within the school’s Christian environment we aim to give each child an understanding and respect for their own tradition and faith and to encourage them to value those of others”. Displays around the school are impressive and many exemplify the high regard for the school values of ‘fairness, respect, cooperation, caring, honesty and resilience’, that are evident within the faiths represented. A special reflective/prayer area has been created which encourages pupils to take time to think, pray or reflect if they feel the need to do so. This area houses the Koran alongside the Bible as well as other symbols of faith and worship; pupils and staff are encouraged to use the area when they feel they would like to. The school achieved ‘Outstanding’ in its most recent Section 48 RE inspection carried out by LDBS. During October the school celebrates Black History Month and this year focused on the Notting Hill Carnival with a chosen year group. At the end of these weeks there is a family gathering for parents and pupils who come together to share food, music and dance from the various cultures represented. The impact of the event is that the school community is drawn together so that diversity and difference can be celebrated, thus encouraging understanding and respect within a fun experience. The school is part of an ‘Excellence in Learning Community’ (ELC) and works closely with 15 other schools in the area. Schools share expertise and learn from each other’s experiences, meeting regularly to exchange and discuss innovative ideas. Recently, staff at St Michael at Bowes have received training about the impact of ‘Growth Mindset’ on both pupils and teachers. The principles have been introduced into lessons and within a short period of time the attitudes to learning have changed. Pupils can be heard to say; ‘I can’t do that yet’ rather than ‘I can’t do that’. Their mindset has changed as they understand that there is no limit to learning. Staff understand the importance of developing pupil aspiration and self-belief and have recently started to compile information about the success of past pupils. A display of photographs and historical information encourages pupils to believe in themselves and their own capacity for success. A current school governor is a past pupil and is also a local Member of Parliament. There are well established links with the main feeder infant school to ensure that transition from Key Stage 1 to Key Stage 2 is a smooth and productive experience for pupils and parents. KS2 teachers visit pupils about to join Year 3 and liaise with staff to familiarise themselves with the needs of pupils. Assessments are moderated, and the head teacher of St Michael at Bowes visits the infant school to lead assemblies and to get to know the children who will soon be joining her school. Parents spoke most positively and on the assessment day some parents of pupils with extra needs were able to describe the way in which the school has given their children focused support. They praised the Inclusion Leader who has been relentless in securing the entitlement of the children and has also raised the self-esteem of the parents, as their efforts have also been recognised. Governors meet on a monthly basis and have developed a ‘Governor of the Month’ approach to visiting the school. They form a critically supportive group and regularly invite staff to attend their meetings to give information about school improvement and curriculum plans. They have two away days each year so that they can reflect on their practice as well as participating in the local authority self-review programme which helps governing bodies to focus on ‘Impact, Challenge and Evidence’ (ICE). All staff had been involved in the preparation for the assessment for the Inclusion Quality Mark either directly as a member of the focus group or by contributing feedback. It was acknowledged that the preparation was ‘hard work’ but that it was very worthwhile in that it guided the staff through a self-evaluation process. The Inclusion Leader had prepared meticulously for the assessment day and the portfolio of evidence and the Self-Evaluation Report gave detailed evidence of the inclusive ethos and practice within the school. During the assessment day I met with a wide range of stakeholders including pupils, parents, teaching and support staff, and governors. It is my view that St Michael at Bowes C.E. Junior School fully meets the standard required by the IQM Inclusive School Award. The success of the school is built on very clear systems responding to ideas from across the workforce. The strong leadership of the headteacher and her senior team is well established and offers a clear and decisive plan for improvement, reflecting a compassionate ethos.